If you missed a family reunion or a funeral of a close friend because you didn’t want to miss the midweek service…you might be a Pharisee. If you ever worried about whether or not you should read the italicized words in you King James Bible because they weren’t in the original text …you might be a Pharisee. If you ever gave your pastor a doctor’s excuse for missing a Sunday evening service …you might be a Pharisee. If you ever tried to exchange your bratwurst for an Italian sausage because you found out they were beer brats …you might be a Pharisee. If you say grace before in-between-meal snacks …you might be a Pharisee. If you won’t let your kids read The Lion, The Witch, and the Wardrobe because there is a witch in the book …you might be a Pharisee. If you object to the new church hymnals because they have “contemporary” songs from the likes of Andrae Crouch and Dallas Holm …you might be a Pharisee. If you think the new youth pastor should not be trusted with the care of your children because he has an ICHTHUS tattoo…you might be a Pharisee. If you rebuked the visiting preacher for not wearing a tie when he was in the pulpit …you might be a Pharisee. If you boycotted The End of the Spear because the part of Nate Saint was played by a homosexual …you might be a Pharisee. If you refuse to watch The Passion of the Christ because it borrows too heavily from Catholic tradition …you might be a Pharisee. Feel free to add any “You might be a Pharisee if…” ideas to the comments section below. This is all from Gamaliel’s Desk by Rick Presley. BTW the comments are about as funny as some of the other “mights”. Tim, Ingrid and the Great Cover up. For the grace of God that brings salvation has appeared to all men. It teaches us to say “No” to ungodliness and worldly passions, and to live self-controlled, upright and godly lives in this present age, while we wait for the blessed hope–the glorious appearing of our great God and Savior, Jesus Christ, who gave himself for us to redeem us from all wickedness and to purify for himself a people that are his very own, eager to do what is good. These, then, are the things you should teach. Encourage and rebuke with all authority. Do not let anyone despise you. In a way I do not want to write this, yet after praying I realized that many of us need to speak out on this topic. It pains me as far as the examples I will use, yet I hope to give a real life presentation of the Gospel in action against the false teachings of some. One of the examples is a friend and I do not wish to bring any more pain to him so I hope that this will not add to his hurt, but lift him out of the pain of those who deem themselves as more worthy sinners than others. Tim Reed is a good guy. I really enjoy his thoughts and have gained things from him. He is a pastor of Owasso Church of Christ. The first thing I want you to note is that I do not agree with Tim on some doctrinal issues, yet I see those issues as secondary to his faith in Christ so I focus on that instead of where we disagree. Now, Tim loves to play some sort of “Fantasy” game which seems to include that one might become an evil dictator who wants to rule the world. Tim stated that he had played these games for many years before coming to Jesus. Ingrid is a radio show host and “watchdoggie” blog. She likes to report on the failings of those she sees as heretics. Now, I agree with her on some things so this is not a total “I am against Ingrid” post. In fact, if I was to percentage out what she talks about, I would agree more with her than against her… yet she seems to think that all falls on the emerging church and is very vocal against those that have a differing “style” of worship ie, pastors should not wear jeans to preach in, churchs should have pews (though I understand she attends a house church) and music for worship can be performed by a secular choir, but not rock music by believers who desire to worship Jesus. So, my “beef” is that she confuses preference with God’s holiness and style with biblical mandates. Now, my biggest issue with Online Discernment Ministries, (ODM’s) is that they often go way overboard in their zeal to expose and shame those they deemed as worse sinners as themselves. In this case Ingrid parsed through 1 and ½ years of posts to find one comment made by Tim (which I will not post here as it is very distasteful). Many of these comments were in defense against atheists who attacked him for his beliefs at the discussion forum, yet he made this one comment that later came back to haunt him. Soon after Tim made the comment he was IM’d by a friend and the moderator who both rebuked Tim for his overboard comment. He saw his wrong and apologized to all offended parties and was forgiven by them. Now, again 1 ½ years later, Ingrid finds times forgiven sins and resurrects them publically to shame Tim and expose him as one of the “new pastors today” she seems to dispise. Now, remember Tim does not deny he stated the things Ingrid posted… and he does show remorse and did all he could to make it right with the people around him. He even went so far as to create a new story line for himself in the game so he would nto be so evil. 5. All was well with the world again. Tim later, (after the post at SoL), deleted his account where Ingrid quoted him as supporters at SoL were attacking those at the forum and judging and condemning them. He openly admits to all this. Then came Ingrid who even after reading all the facts having already stated Tim to be one of the “enemies of Jesus Christ”, states he is being “deceptive”. Here is Tim’s side if you want to read it. As far as living out the obedience to Jesus by forgiving others as He commanded, Ingrid seems to think that is not a command that applies to her. Forgiveness is not part of the ODM’s doctrine when it comes to those they hate. I am sorry, but out of all this I do not see these verses coming out of the ODM’s side at all. I have heard the ODM’s state things as, “You redefine fundamentalist. You redefine pharisee You redefine salvation. You redefine Jesus and the Gospel. You are a credit to post-modern dogma. The Gospel is all about reconciliation and forgiveness. It is not an excuse to blow-off sin.” Yet, then miss the very opportunity to forgive the stated sin… but instead cast more self righteous stones at Tim or whoever. Now, what motivates such people to hate others so much? I will not get into Ingrid’s or others motives, as they will be exposed by God in His due time. Yet, I have found from experience, both out of my life as one who would at one time cast stones without thought to giving forgiveness, and having received the stones from the ODM’s myself. They seem to express some sort of maturity yet seem to miss the core of the Gospel of Reconciliation. In fact these (again I include myself as I did this myself) mock the very Gospel they proclaim. I will add that a person who is inclined to cast stones often does not understand the forgivness and Grace of God as they trust their own works as the “back-up” if God’s grace is not sufficient for them after all. Is sin forgiven? According to the bible there is not one doubt and without hesitation I must state yes! Yet, it seems that if one does not like a person, a religionist will not accept the “so called” offender repentance. In this lack of grasping the Gospel of reconciliation they give no reconciliation to the other and only mock God and the gospel as they leave the other in their sin. I will state this about Tim; he did all that God required so no man (or woman) has a right to add to that. To those who dig up old dirt then use it to shame and “expose” others only expose that they know not Grace nor love the Kindness of God. They seek only to show how right they are in their own eyes. Such a person need be avoided for they shame the Gospel and count Jesus Blood as nothing. I see that often the very sins one notices in others is the type of sin we see in ourselves. If one is under the performance type faith and sees God as the “God Father” instead of God the Father, then they well view obedience as “payment” to keep their god happy. They deceive themselves as only Jesus pleased the Father and we all need be in Christ to also be pleasing to God. Without Jesus no one is pleasing to God. In that being the truth, no one can boast that they are more pleasing to God than another. That is called humility. Tim is being accused of covering up his sins… he is not. I see though that some sin openly against their brothers and sisters in the role of being the Accuser of them. 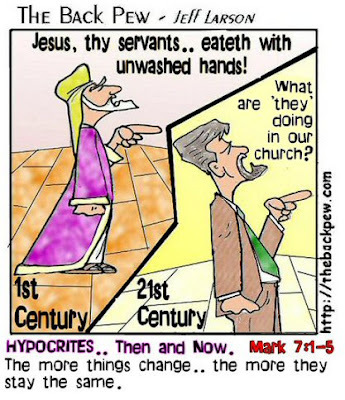 They then cover their own sin in a thin veil of self righteous prater that only drive more away from Jesus or more into a false gospel of works. Tim has grown from this and sees the error of his ways… yet it seems that God teaching someone and freeing them of their past sins, is not enough for Ingrid and others. 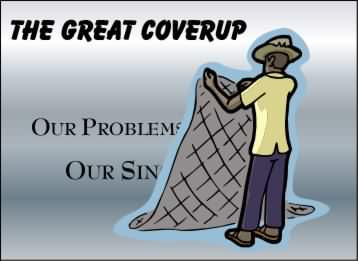 I see the Great Cover Up is about those who condone the sin of Ingrid, Ken and others as they slander and lie and continue to set a standard of righteouness that is not biblical and in fact cuts across the grain of the Gospel. If one though did repent and confess their sin, I for one would be fighting for a place in line to offer forgivness and a huge hug. This guy usually bothers me but at poop is emergent too he has an interesting take on Ken Silva and Tony Jones.. though I do not agree 100% I see that not all on Ken Silva’s side agree with him and his tactics.